Animal Talk Messages: If You Could Hear Your Pet’s Voice, What Would Your Animal Communicate To You? It’s mind-boggling to think about, I know. 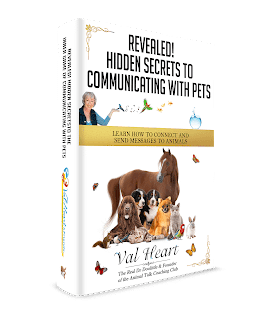 But just for a moment, imagine how your life would change if you could communicate with your dog, cat or horse. What if you could leap across all boundaries and discover your sense of connection with your animal friends and the whole circle of life? I must confess I love seeing people just like you re-remember a long forgotten language – talking and listening telepathically from the mind and heart. Nothing gives me more satisfaction. What really excites me is that I know it’s possible for you to do the same. I understand if you’re skeptical. As a matter of fact, I encourage skepticism. You should listen and observe with your heart, but not be so open your common sense falls out! Perhaps you’ve heard from family or friends that telepathic communication is some kind of far-fetched woo-woo magic for strange people with purple robes and crystal balls. Nothing could be further from the truth! I’m just a Texas gal at heart that grew up surrounded by all kinds of creatures – and I don’t even own a purple robe. Truth be told, I’m probably a lot like you. I know this because the fact that you’re reading this article tells me three things about you. You are enlightened and willing to consider that animals truly do have wisdom and knowing worth exploring. You want to better understand and improve your relationship with your animal. You and your pet may be struggling with health or behavior problems and you’re wondering what in the world to try next. As an animal communicator, I’m truly concerned that you most likely aren’t getting the answers you want and deserve in your search for a better relationship with your animal friend. So many of my clients have been exactly where you may be right now; struggling with relationship or behavior issues that spill over into other aspects of your life. And, I know it would be easy to turn away from this, thinking youâ€™ve tried everything and there simply isn’t hope for your situation. That simply isn’t true! In fact, if you’re floundering in a wilderness of confusion right now, the first thing you must know is. Animals Want To Be Heard! Animals are telepathic. They can see what is in your mind’s eye, and feel what you are feeling. Have you ever noticed how Fido disappears when it’s time to go to the Vet? Or how your pet appears almost magically when you have something good to eat? This isn’t an accident or a coincidence. If they are paying attention, they always know what’s going on. They also want to help you. They do NOT want or need to be fixed because there’s nothing wrong with them. They DO need you to listen to and acknowledge them. Â You don’t have to have all the answers but you do need to have the heart to open up, listen, and be present with them. Chances are if you have a heart’s desire to develop your telepathic abilities, you may be thinking something like this. All these things are possible and happen quite naturally when you connect with the fellow beings that share our planet. Instead of experiencing life only from the lens of your perspective, you expand your awareness of all creation and introduce a new dimension to your world. Imagine how thrilling that would be! Perhaps until now, you never thought to give your animal a voice in these situations that so drastically affects them. It;s one of the most troubling aspects of trying to care for your animal. Because as much as you love them, you can’t give them the best possible life because so much of their world is closed off to you. You second-guess what may be troubling them, but in the end, you’re probably just shooting in the dark. It is crucially important that you forget this because no matter how you define the problems you’re having right now, once you open your mind and heart to communicating with them, everything changes! © Copyright Val Heart & Friends LLC. All Rights Reserved. Reprint rights by request only. I for one would definitely want to communicate with my kitty. There are just times that I can’t get how she feels and I wish I’ll know for sure that she’s not in any pain or sickness.